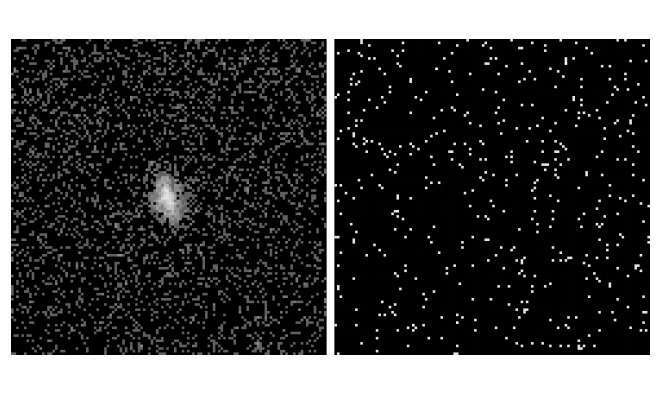 Chandra images of the 1×1 arcmin field centred around M86 tULX-1 on 2013 July 24-25 (left), and the same field on 2016 May 2 (right). Credit: van Haaften et al., 2018. Using data provided by NASA's Chandra spacecraft, astronomers have identified a new unusual ultraluminous X-ray source (ULX) in the elliptical galaxy Messier 86. The newly found ULX, designated M86 tULX-1, resides some 62,000 light years away from the galaxy's center. The finding is reported in a paper published November 26 on arXiv.org. ULXs are point sources in the sky that are so bright in X-rays that each emits more radiation than 1 million suns emit at all wavelengths. They are less luminous than active galactic nuclei, but more consistently luminous than any known stellar process. Although numerous studies of ULXs have been conducted, the basic nature of these sources still remains unsolved. Usually there is one ULX per galaxy in galaxies that host them, but some galaxies were found to contain many such sources. While ULXs are most commonly found in spiral galaxies, starburst galaxies and in or close to star-forming regions within galaxies, smaller numbers of these sources reside in elliptical galaxies. Located some 52 million light years away in the Virgo Cluster, Messier 86, or M86 (also known as NGC 4406) turns out to be such an elliptical galaxy hosting at least two ULXs. According to a new study conducted by a team of astronomers led by Lennart M. van Haaften of Texas Tech University, archival data from Chandra X-ray Observatory's Advanced CCD Imaging Spectrometer show that M86 contains a ULX located about 62,000 light years northwest of the center of the galaxy. The newly found ULX is therefore the second such source in M86, after CXO J122611.830+125647.80, which was identified in 2011. "In this paper we report the discovery of CXOU J122602.3+125951 (hereafter M86 tULX-1), a ULX, in the giant Virgo Cluster elliptical galaxy M86," the researchers wrote in the paper. The study found that M86 tULX-1 has an X-ray luminosity of approximately 5.0 duodecillion erg/s, soft excess X-ray luminosity of 1.9 duodecillion erg/s, and an inner disc temperature of 0.66 keV. The researchers emphasized that relatively hard spectrum and transient behavior of M86 tULX-1, along with its other properties like high luminosity and location in the field of an elliptical galaxy, make this source an unusual ULX. When it comes to the nature of M86 tULX-1, the authors of the paper favor two scenarios. They assume that this source may be a stellar-mass black hole of about 30 to 100 times more massive than our sun accreting matter from a low-mass giant companion. The second most plausible hypothesis is that it is a stellar-mass black hole in a transitional state between the normal stellar-mass black holes and those in the ultraluminous state. Other scenarios taken into account that could explain the nature of M86 tULX-1 are: active galactic nucleus, gravitational microlensing event, tidal disruption event, cataclysmic variable, flare star or very faint X-ray transient in the Galactic halo, and supernova or gamma-ray afterglow. The team concluded that follow-up observations of M86 tULX-1 with XMM-Newton and James Webb Space Telescope (JWST) would be much helpful in order to better constrain the nature of this source. They assume that this source may be a stellar-mass black hole of about 30 to 100 times more massive than our sun accreting matter from a low-mass giant companion. The second most plausible hypothesis is that it is a stellar-mass black hole in a transitional state between the normal stellar-mass black holes and those in the ultraluminous state. More likely an intermediate Core star 'grey hole' within a globular cluster growing from within as it progresses outward to eventually form a daughter galaxy of it's own. Yes, periodic ejections means that it may be in the active ejecting state at the moment, so it can now be seen. Gosh tux, you really should be allowing access to your private research facility. With all that super-duper advanced technology you invented. That enables your claim that you have physical proof that all the scientific researchers have failed to produce. That all their observations & data collected can be discarded for not supporting your speculations. Cause obviously you are centuries in advance above all the rest of the World, No wonder none of the "Real" scientists will accept your findings or confirm your conclusions. They are all jealous that you have shinier toys then they do! Yep, that explains why you are the only person who can see such miraculous phenomena! Intellectual egomaniacs are easy to spot on this board, lashing out to cover their own insecurities and to justify their technical insight limitations in their own feeble minds. Taking cover in higher authorities, is a poor man's attempt to allay his inability to comprehend, or even worse, his lack of original intellectual curiosity. It has been this way for centuries. The truth about nature will be far more mysterious than can be gleamed by the irrationally rational intellectual egomaniac, so prevalent trolling this board. So maybe ask yourself, why are you frightened of pure understanding? What are you really defending? We're defending real science against the pseudoscientific rubbish promoted by the likes of you. Funny you think science needs defending. LOL! Thanks for confirming your insecurity! That's SO rich, coming from the guy who has no ideas of his own, very evidently has no scientific training or discipline, and simply parrots what he's read from his own "higher authority" LaViolette's arrant pseudoscientific "Continuous Creation" nonsense! Keep it up, Tux, make the old man proud of you! Interesting. Makes one wonder if we're looking at a whole class of objects including both GRBs and ULXs.